Oh, the struggles of celebrity. There I was getting a preview of the 23rd Annual Pasadena ASID Home and Kitchen Tour when there they were– the paparazzi. Hey, I’m trying to work here, but no avail, photographer Terry Miller had spotted the 31st Occasional Pasadena Doo Dah Parade Queen – me – and couldn’t resist. Horrors! Queen cuts up at exclusive event. SGVN photographer James Carbone (in front) grins and bears it. Thank you Sir Terence and may my loyal subjects enjoy my folly. The ASID tour will be held Oct. 4. For more information, visit www.asidpasadena.org. 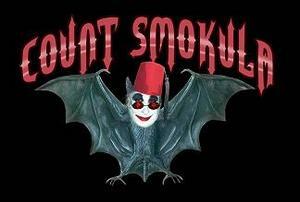 496 year-old undead, accordion-playing, ventriloquist, comic cult icon and Hollywood-based legend, Count Smokula, will release a brand new series of episodes on the new web-based channel at http://www.therealuhf.tv and http://www.therealuhf.com on August 4. The Count will interact in this sketch-comedy series with guests at his Castle and basement laboratory in Smokesylvania. Among the guests in the first season are Tom Green, George Clinton (Dr. Funkenstein from Parliament Funkadelic), Lloyd Kaufman (director of “The Toxic Avenger” and head of Troma Entertainment), Jerry Casale (Devo), Rena Riffel (from “Showgirls”, “Mulholland Drive” and “Trasharella”), Shelley Michelle (Hollywood body-double), The Fabulous Miss Wendy, David Liebe Hart (Tim and Eric), violin prodigy Eliza James (Burt Bacharach), Dan Lacob, The Radioactive Chicken Heads, Green Jello, Ben Going, Simone Turkington and chanteuse/actress Christina Linhardt. Webstars Roobie Breastnut, Jade Paris, Bella Rose make appearances as The Count’s ill-fated dates from matchstick.com. The series is directed by Thomas Hurley III (Bill Nye, the Science Guy Show) and written by Count Smokula, Zack Wolk and Thomas Hurley III. The series will also feature new Count Smokula musical numbers and music videos. Count Smokula previously co-starred in “Trasharella” and hosted “The Count Smokula Show” as a public-access talk show. He has appeared in and composed songs for such films as Troma’s “Poultrygeist”, “All the Love You Cannes”, “Tales from the Crapper”, as well as “Die You Zombie Bastards”, “Vampira” , “Camp Burlesque” and “The Devil’s Muse”. He has also been seen worldwide on tv shows such as “Blind Date”, “Last Comic Standing”, “30 Seconds to Fame”, Stan Lee’s “Who Wants to Be a Superhero”, “Troma’s Edge TV”, “Extreme Gong Show”, “Tom Green Show” and Fred Willard’s “Parades and Festivals from around the World”. The Count’s album “Authentic Sounds of Smokesylvania” was named Comedy Album of the Year 2003 by the Los Angeles Music Awards and he has also won Best Comedy Performer Awards from the Los Angeles Music Awards and Rock City Music News Awards. The Count is ringmaster of The Vamphear Circus, and has emceed numerous film and music festivals , award ceremonies, comedy and burlesque shows. Therealuhf.tv is a new web-based entertainment channel created by Zack Wolk who previously was a producer on “The Tom Green Show” and also “Tim and Eric Awesome Show, Great Job”. Wolk was inspired to create this network after seeing Weird Al Yankovic’s film “UHF” and he sought and received Weird Al’s blessing in using the name. Other new series which will be released on the first season include “The Dr. Demento Show”, “The Neil Hamburger Show” and Pleaseasaur’s “Product Placement Show”.